Update on a story we told you about a while ago… Mary Scott Huff reports that two of her stolen sweaters were found at a Goodwill store in Portland, Oregon. They were totally unharmed, and a team of searchers is now combing other stores in the region. Alberta fiber artist Linda Cunningham is knitting a fiber labyrinth during month long stay at Epcor Centreâ€™s Ledge Gallery in Calgary.The piece is intended to be one of the visual arts attractions of the Calgary International Childrenâ€™s Festival, with visitors encouraged to walk through the labyrinth. It will be on display until May 28th. 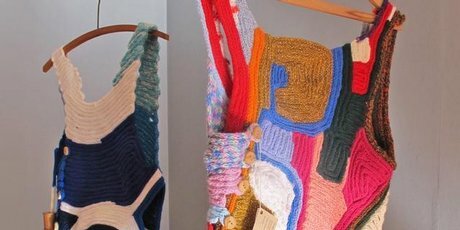 Anti-consumerist fashion designer Emma Churchill’s new exhibition “French Knitting” at Lopdell House Gallery in Auckland, NZ, aims to challenge our approach to what we buy and encourage us to explore the production processes that go on to create those items we do buy. Australian fiber artist Teresa Dair appeared at the Craft and Quilt show in Perth, Australia this past weekend, demonstrating the art of “body knitting” – using her fingers and arms to replace the traditional needles in making garments. She also replaces traditional materials with all sorts of “rough” materials, including steel wool and paper. Her garment and jewelry designs are fabulous – her site is definitely worth a visit. On the topic of “body knitting”, a group of first and second graders in Vermont are looking to break the Guinness World record for team finger knitting. The current record is held by a group of Austrian fourth-graders, for a strip of knitting 3.85 miles long. The Vermont students have a little more than four miles already, and will be working until June 8th, when the official measurement will be taken. A nice piece on the Guardian newspaper blog about the use of craft to engage the public in science, highlighting the various coral reef projects, and the Stitch a Squid event at London’s Natural History Museum last year. Artist Ed Bing Lee has launched his “Delectable” collection – a series of knotted, beaded and woven desserts. Not knitted, but still stunningly beautiful! Did anyone win the knitting needles? How to choose your first ukulele: an essay by your uke-obsessed Editor.